Very versatile surfboard with a very moderate rocker. 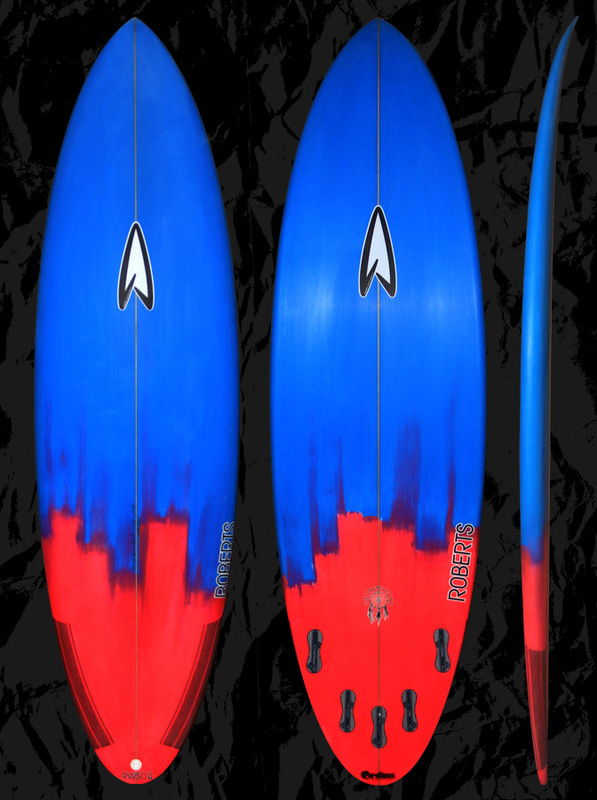 It carries foam throughout the whole board allowing the surfer to catch plenty of waves. Single to a double concave with a pulled in thumb tail which helps the board hold in bigger surf. The pulled in tail also helps control high-speed turns. ​A very fun board to ride. It can be approached from surfers of all different abilities due to it's shape. Will function well in everyday surf due to the moderate rocker, fuller rails and nose outline. Also works great very hollow fast waves due to the pulled tail and double concave. This thing is a barrel machine and will fly through sections. Moderate rocker with a small amount of flip in the nose allowing it to go really fast and avoid pearling on the drops. Allows riders to cruise and have tons of speed without working too hard for it. Medium to Full for stability and float, with tucked hard edges for speed and holding power. Single to double concave for control of the speed the board will generate. Five fin is standard, can also be ordered as thruster or with a single fin box and side bites. Compared to a WD, WD2 or similar go 1” longer. Use the same thickness and volume or slightly more for even easier wave catching ability For width go up to 1/2" narrower to add sensitivity, less to carry more speed. Comparing to a pro model shortboard go 1-4" shorter, up to 5/8" wider and same to 1/16 thicker for a slightly higher volume. For a high performance approach based on your height, aim for about the same length to as much as 3 or 4” shorter as you are tall, matching volume to skill level, needs, or preferences. Up in volume and at your height or beyond for additional stability and wave catching ease. Custom dims are always available. Please feel free to use our CONTACT US form for more info about our boards and sizing.